For foliar applications; creates a physical silicon matrix barrier and causes insect dessication. 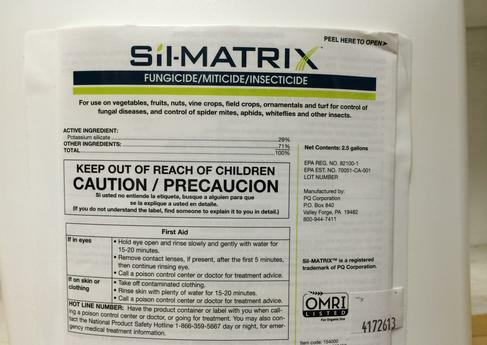 Labeled for some airborne foliar diseases and some insects – See label for details. Tank solution pH is very important when using this product. A pH of less than 5.5 or more than 7 is recommended. Failure to follow the pH protocol may cause severe gelling of product – this gelling is not easily reversible. Also, should not be used with most inorganic fertilizers – a reaction will occur, causing settling and a loss of product efficiency.